The simple actions that person living with dementia perform each day can lead us to only one conclusion. Many Alzheimer's and dementia patients shadow their caregiver. This means they follow us around, or call out our name when when they can't see us. 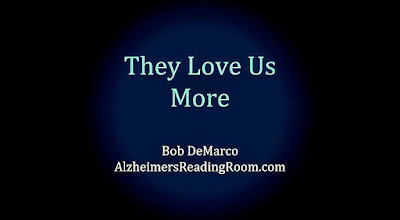 Alzheimer's patients often become angry when we leave them alone for any period of time. They asked for us repeatedly and want to know when we are coming back. They miss us fiercely. They miss us because we are their connection to the world. They miss us because they rely on us to protect them against any and all demons real or imagined. Have you ever given any real thought to this phenomena? You should. Title: "Alzheimer's - They Love Us More"